Does Chronicall Support Collective Call Ringing? Does Chronicall support Collective Call ringing for IP Office? While Chronicall will still log and capture call details within a collective call ringing environment, it does heavily skew the statistics. This is especially true if you have a multi-site IP Office setup. Chronicall will receive “packets of raw PBX data” through TCP or UDP from Avaya IP Office. Chronicall will then translate those packets into events and store those in the database for Realtime and historical Reporting. "Call from 801-555-4444 is RINGING agent John Doe (123)"
"Call from 801-555-4444 is RINGING agent Mike Smith (124)"
"Call from 801-555-4444 is RINGING agent Steve Jones (125)"
"Call from 801-555-4444 is RINGING agent Larry Thomas (126)"
"Call from 801-555-4444 was MISSED by agent John Doe (123)"
"Call from 801-555-4444 was MISSED by agent Mike Smith (124)"
"Call from 801-555-4444 was ANSWERED by agent Steve Jones (125)"
"Call from 801-555-4444 was MISSED by agent Larry Thomas (126)"
Chronicall would then record 3 missed call events to the 1 answer event, skewing the connected Realtime and historical reports. If you run Chronicall in a collective ringing environment, Xima Support will not be able to resolve any related data discrepancies that you might experience due to the inconsistancy of the data we receive from the PBX. In a collective ring scenario, IPO simultaneously rings multiple people in one group. If there are two or more IPOs, we see a high amount of ringing to related hunt groups with no recipient. Collective ringing can cause split calls as well in Cradle to Grave. One call could appear as several inbound calls from the same phone number, at the same time, presented to different agents. Since many factors such as time delays happen between IP Offices, we may end up with one IP Office answering the call with an agent, and the other IPO still ringing the group after the call has been answered. This causes havoc to the data sets we pull from the phone system as we time stamp all our PBX events. This will also cause repeated ringing events or missed calls in this case for an agent or group, affecting your reported service levels. We can not guarantee accurate data at an agent level if you are looking to report on service levels. For example, if you have one call ringing 8 agents at a time, and only one answers, that would be 7 missed calls and one answered call for those agents. So even though just 1 call dropped in, it resulted in 7 missed call and one answered call for overall statistics. To help offset the inconsistent event data received as a result of simultaneous ringing, Chronicall does have a setting that can help reduce some of the undesirable event data. 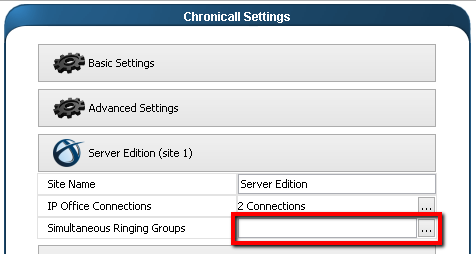 Navigate to Admin(System) > System Settings > Server Edition > Simultaneous Ringing Groups. Note: When a call is routed to a selected Simultaneous Ringing Group, a ringing event will be assigned to the Group rather than the Agent. This will provide consistency with reporting when reporting on a group level but will affect your agent level reporting.